We’re skateboarders. When we don’t skate we think about it, read about it or…watch videos. It’s a our way to get stoked and keep up with industry gossip/news. There are various ways to do this, but one of the best is through skateboard mags. Nothing beats holding a copy, reading the stories and looking at all the cool pictures. It’s a great experience. Specially, now when everything is digitalised. 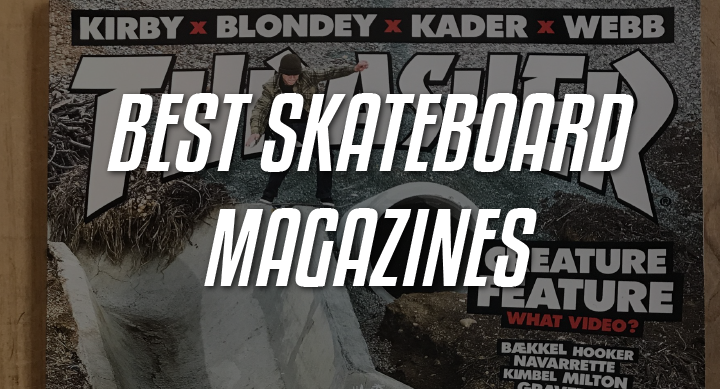 Today I will be talking about the best skate magazines you can buy for a kid and which are the hottest and most popular right now. You’ve probably seen this magazine’s logo everywhere, on skateboards, in videos, on t-shirts, hoodies etc. So much so that a lot of non-skateboarders recognize its famous logo. Thrasher has been around since 1981, so a long time obviously and they are still going strong. They feature a lot of skateboarding (obviously), a lot of the lifestyle surrounding it and have interviews with some of the best pro’s in the game. They also have a great online presence and a youtube channel where they feature exclusive “parts” (video compilations) of some pro skaters. They have other shows such as Skateline, King of the Road (KotR), Rough cut and many others exclusive to them. They make an effort to include girl skaters and as such, they have a diverse line up of content. They do a killer job with photography and feature some great photos. In the past, they had some pretty gnarly and edgy inappropriate content, but they have adjusted for modern times and feature only gnarly age-appropriate content. They would be a great gift, they are pretty popular and cool to have. You can get it on Amazon.com here. Operating out of Carlsbad, California, this magazine started out in order to provide a skateboard magazine for kids. At the time, the available magazine’s were too brash and featured inappropriate content for kids, Transworld was created in response because some people in the industry realised there needed to be a safe option for kids. Since then, they’ve provided radical, gnarly and great skate content safe for kids to consume. Otherwise, the magazine is full of content, with contributions from the best skateboarders and skate photographers in the world. Providing a high level of quality (and quantity) of content in this magazine (it has a lot more pages and info than the other magazines). With Transworld, it’s easy to get a skateboard magazine subscription. They have both a digital and physical magazine so you can pick which one you would like to get. Though it is only released once every two months. They also have a pretty strong presence on social media and have regular shows going on on their youtube channels. You can get it on Amazon.com here. Having started out in 2004, this skateboard magazine (literally) has aimed to provide high-quality skate content through writing, media, and design. All their staff are skaters with a lot of experience in the industry so you know they know their stuff, and it actually shows as they are the second most popular mag behind Thrasher (in fact the founders used to work for Transworld). They have released over 162 issues since 2004 and are still going strong. They mainly use digital photography and modern media techniques to capture their content and use it as a guideline to direct their vision – some of their pictures are honestly beautiful and I have a few posters up on my wall. They have the best covers in skateboarding. They are under the umbrella of The Berrics (for the last 4 years) and are able to collaborate and release some of their content through their magazine. Their content sometimes tends to be mature but is otherwise ok for kids to read and check out. They also feature riders of all levels so their content is very relatable and if your kid likes photograhs (and The Berrics) they’ll love this mag. You can get it on Amazon.com here. This magazine mostly features longboard, longboarding media and content. A lot of stories about skate trips, skater gear, industry news etc. With quality contributions from skaters themselves and other from photographers around the world. It is super inclusive and features content from different continents and features female longboarders when possible. It is definitely kid friendly and doesn’t feature any mature or inappropriate content. In fact, they’ve featured contributions from kids once in a while. They have both a print copy and an online blog. The blog features a diverse range of content, with videos, articles, features on the latest gear and low down on the latest events. The magazine itself has exclusive content and pictures, it’s soo good and exciting to read from cover to cover. This mag helps bring together the longboard community and information from around the world. It would be a good pick for any kid. It gives so much to info learn with so much content to simply enjoy. New skateboard bearings and other gear – every skater needs new bearings. It is also nice to have extra gear like wheels, trucks a new deck and even wax lying around, so they make useful gifts. But bearings or decks are the best, these items sometimes break unexpectedly. A skateboarding camp experience. Camp provides an opportunity to focus, learn and improve one’s skill whilst being surrounded by like-minded people. They are usually unforgettable experiences, which is what you want in a gift right? An electric skateboard. This can provide a fresh perspective and experience of skating for them. They are fun and easy to use. There are loads of kid’s e-skateboards that are safe and easy to ride available so it won’t be a tough choice to make. So which one is the best gift? I think the best gift for a kid is either the Thrasher or Transworld magazines. However, if your kid is younger than 13, then the Transworld or Skateboard Mag is best. Transworld is kid-friendly whilst the Skateboard mag has great photos to look – which is great if your kid might find trouble digesting all the words and would prefer photos. If you have a teenage, any of the magazines would be good. In fact, it might be a good idea to sneak into their room and see if they got any skate mags lying around, it could tell you which magazines they prefer to get. Then you simply get them the latest issue, or even better a year subscription. For longboarding, definitely skate slate. There is not better longboard mag out there, hands down.